December 9, 2016 | -by: Kevin George. Just like ‘one size doesn’t fit all’, everyone has a different taste. Thus segmentation comes into play. ‘Segmentation’ in email marketing is like knowing the ‘exact measure’, of what ingredients must go in a dish, to make it totally lip-smacking! As per a MarketingSherpa Report, 32% of marketers aim to segment their email database in the coming years. This aligns email marketing towards ‘quality’ and ‘relevance’. To ultimately understand and achieve this we must understand the inception process first. 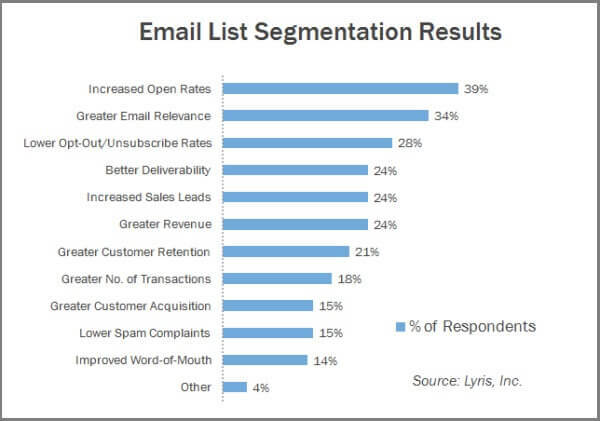 According to the following Email list Segmentation graph by Lyris, email list segmentation helps to boost open rates by up to 39%. This happens because these emails have a greater ‘relevance’ with what the subscriber is looking out for. For a customer to get personalized, perfectly curated, interest sparking emails, is exactly like a tummy-filling, appetizing dish with a burst of flavors – simply perfect. Email segmentation is all about segmenting your email lists, according to various sections, based on customer behavior, geography, age, gender, last purchases, etc. As a list building activity, Organic Aromas Boosted Newsletter Signups by 150% when they made use of smartly designed pop-ups for lead generation. 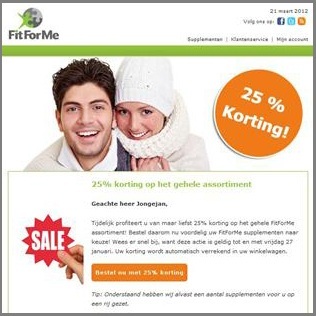 The design of the email also plays a great role in attracting and retaining customers. A bright, colorful and reader-friendly email templates can be a boon for conversions. Geographic segmentation is one of the easiest way to divide and bifurcate leads according to their location. This process helps to create small chunks that are easy to cover and observe. In turn, this helps in gathering quality information of the targeted area and the customer. Thus boosting open and click rates. Targeting according to the weather conditions, cultural preferences, religion, language, topography and demography can be a part of this segment to enhance the open and click rates. 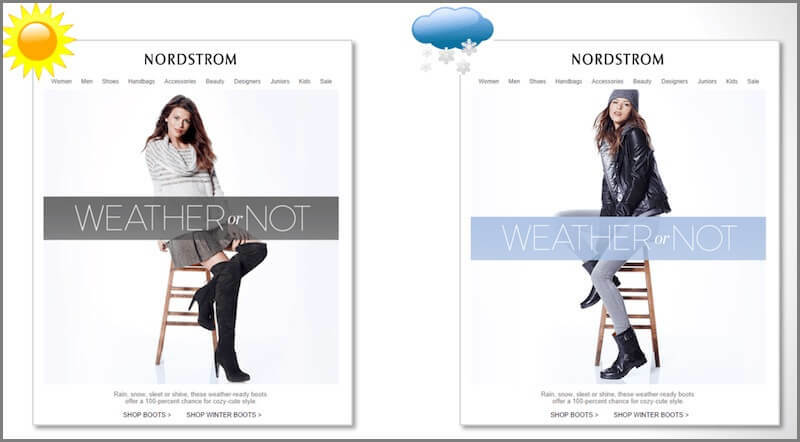 Gender plays a major role in curating email content and designing the templates. Men and women have different tastes and preferences and catering to that is exactly what will boost your email opens. Segmenting your emails according to male and female customers and providing them relevant products is a great way to start. You can send different emails like J. Crew has done in the following email examples or even have one email template targeting both male and female like mini Boden has done in the following email example. Sending relevant emails to customers and taking a note of their age bar can really help increase your email open rates. A 14 year old wouldn’t want an email that caters to person who is in their 50s and vice versa. It’s just not relevant unless in certain cases. Knowing the ‘age’ of your customer is an important aspect for better connection and for you to send relevant information for better open and click results. Make sure to track your customers purchase history and their activities. This helps to better understand their purchase pattern as well as their purchase history. Understanding what interests your customer is a great way to push their interests and see better email open and clicks. It’s noted according to an eMarketer report that 81% of online shoppers who receive emails based on previous shopping habits were at least somewhat likely to make a purchase as a result of targeted email. Cross selling and upselling products through your emails can really generate interest as well as give reference of similar products that help generate interest and attract customers to make a purchase thus enhancing open, clicks and conversions. Segmentation greatly aids in email automation series. As per DMA report, over 75% of email revenue is generated by triggered campaigns, rather than one-size-fits-all campaigns. Automated email campaigns account for 21% of email marketing revenue. These automated emails are segmented according to the purpose of each email. To know how, let’s dive into each. Welcome emails have 320% more revenue per email than other promotional emails. This is great, as brands who send ‘welcome emails’, to their subscribers get more opens and click-through rates. Apart from this, welcome email series also help the brand to showcase and make an impression as the customer gains knowledge about the product. These email series keep the customers updated. Be it their account information, time for updating a particular service or product or just to keep the customer up-to-date. These emails are automated and are a great example of segmentation. Customers who’ve not been active since a while or who you’d wish to stay connected to receive these email series. Emails with “We miss you” or “We haven’t heard from you” intros usually fall under this bracket. These segmented emails are sent to re-engage lost customers. As per a SaleCycle statistics, cart abandonment has reached 74.52% in 2016. As per these reports, these seem to be the most frequently sent automated emails. These emails mark the revival or win back of customers who abandon an online shopping cart. Only this segmented group of people receive these emails. Segmentation is a booming method that marketers and brands are adopting, to target and penetrate the market easily. Segmented emails are a popular method to break down leads as per their preferences and at the same time providing them relevant information for maximizing Click-Through-Rate.